While scrolling through Facebook one day, Eunice was struck by a sudden memory. "I had a visceral reaction and thought, 'Oh my God!'" She had found a photograph of her childhood school, Mrs. Howard's Garden of Children. The photo will be part of a display at this museum to celebrate the opening of the National Museum of African American History and Culture, our neighbor on the National Mall. Our display, titled Celebration: Snapshots of African American Communities, documents life in African American communities. We don't have much information about these pictures, so we were excited when Eunice contacted us. She and I chatted over the phone about Mrs. Howard's and life in D.C. The school gave her fond memories, as well as instilling pride, motivation, and intelligence. "I was four years old there, I was in the first grade . . . we were reading," she said. While the fact that four-year-olds were reading was surprising to me, but Eunice responded, "don't get me started on what kids can and can't do." It would surely make Mrs. Howard happy to know that her former student feels this way. 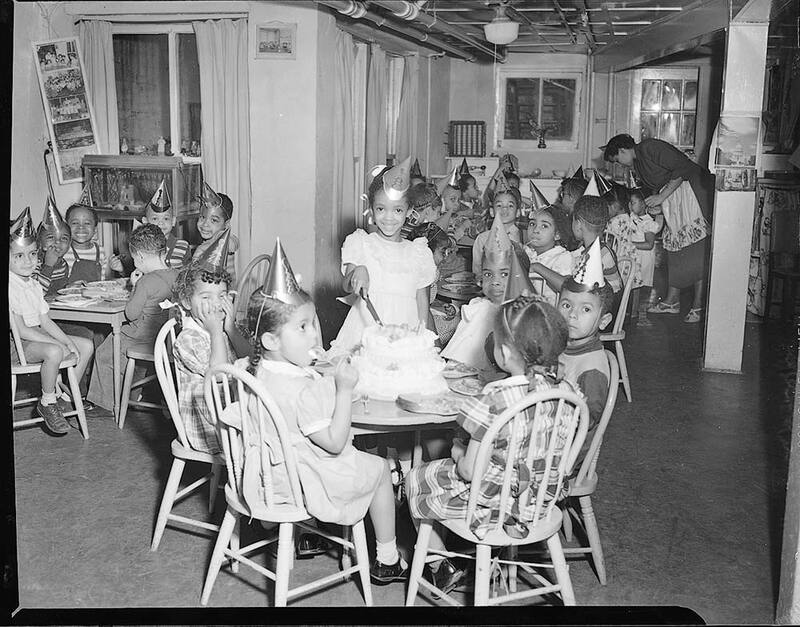 In 1929 Dorothy Howard began one of the first nursery schools for black children in Washington, D.C. It stayed open for 32 years, until 1961. According to the Washington Post the school's initial opening was fueled by Howard's desire to return to teaching and her struggle to find anyone to watch her daughter. It was located in her home at 1728 S St. NW in Dupont Circle. Initially, there were fewer than a dozen students, but numbers evened out to 44 students per year. Howard believed that pre-K should be educational and not just a form of babysitting. This philosophy was popular among some African American parents in the D.C. area. Diplomats, deans, and university presidents all sent their children to Mrs. Howard. Eunice attended Mrs. Howard's in 1942; the photo is from 1949. Nevertheless, she has fond memories of her time at the school. She remembers in particular how well the school prepared and shaped her. The Washington Post explained how in the 1920s, when Mrs. Howard opened her school, children didn't go to school before kindergarten. Howard thought black children would benefit from early learning. Eunice told me how many of Mrs. Howard's students went on to be successful in their future academic careers and beyond. "Most of the people that were in that school became professionals in the real sense of the word," she said. "We were prepared academically and you felt like you could do anything anybody put in front of you. That carries over even now." Growing up in Washington, D.C., in the 1950s, "segregation was harsh and in place," Eunice said. "I couldn't go downtown and try on clothes. You couldn't go to the restroom unless you went to the public restrooms in the Carnegie Library." That's why Mrs. Howard's school was so important. "It was something we all knew, that we were as good or better than anybody else." Eunice was taught self-motivation at home, too. Her mother owned a beauty salon. "There's an old saying that no matter what happens, a woman is going to get her hair done," she said of its success. "She opened her own shop and it just grew. I think about learning that you can do whatever you set your mind to." Eunice helped out at the salon, too. "When I got old enough [my mother] let me wash hair." Her father worked for the government. Eunice discovered he was at a lower pay grade level than he deserved. She wrote a letter to his boss and made her father sign it. "It was a letter that he'd been there for so many years, that he had trained the person for whom the letter was directed. . . . They [moved up his pay grade] in about a month because they knew they were wrong," she said. When he retired, he opened his own cab company. "When he died, he . . . had about 30 cabs on the street," she told me. When asked how she felt that a photo of her childhood school would be displayed in a Smithsonian museum, Eunice responded, "I think it's great, but to me it's no big deal. It should be in there." We're grateful that Eunice shared such wonderful memories. Museums often preserve artifacts, but this is an instance of how museums preserve personal experiences as well. What we learn in our childhood is often what shapes us as we grow up. Mrs. Howard's impact can still be felt. Hopefully we can find more stories about the photographs in this display in the near future. Note: Eunice requested that we use only her first name in this article. Evelyn Mantegani is an intern in the New Media Department and Photographic History Collection.